WASHINGTON (AllPolitics, March 27) -- President Bill Clinton's approval rating remains relatively high, while House Speaker Newt Gingrich's has hit another all-time low. But four in 10 Americans think that neither the president nor the Republican leaders in Congress have a clear plan for solving the country's problems, according to a new poll. In a CNN/USA Today/Gallup survey released today, the number of Americans who approve of the job that Al Gore is doing as vice president is identical to Clinton's approval rating, emphasizing how much Gore's future is tied to Clinton's. Neither Clinton nor Gore appear to be seriously damaged by the campaign fund-raising controversy so far. Clinton's approval rating has actually risen slightly from a month ago, the probable result of a successful summit with Russian President Boris Yeltsin. One indication of that is the number of Americans who approve of how Clinton is handling foreign affairs is back over 50 percent, a five-point gain since late February. The survey was taken March 24-26, and for the entire sample of 1,009 people, it has a margin of sampling error of +/- 3 percentage points. Who Has Clear Plan for Solving Country's Problems? Should the Republicans postpone their attempts to include tax cuts in their overall plan to reduce the budget deficit? Only one in five Americans think so, and a majority now believes that tax cuts and deficit reduction can be accomplished at the same time. With tax time approaching, how do Americans feel about their overall tax bill? Fifty-eight percent say the amount of federal income tax they have to pay is too high, although that is down from 64 percent who felt that way last spring. Yet a majority feel that the income tax they will have to pay this year is fair. Should GOP Postpone Tax Cuts in Budget Plan? Only one in five Americans believes that Clinton's fund-raising activities were illegal, and two-thirds do not feel that the fund-raising controversy is so serious that it makes them doubt Clinton's ability to run the country. By contrast, only bare majorities felt that way about Ronald Reagan during the Iran-Contra affair. But the public is split over whether Clinton is trying to cover up what he really did in his fund-raising activities or cooperating as much as possible in letting the public know about those activities. Forty-six percent feel he is cooperating; 46 percent feel he is covering something up. And only 44 percent say Clinton is honest and trustworthy, although 55 percent say he is honest and trustworthy enough to be president. Neither of those figures has changed since 1996, further evidence that the fund-raising controversy has not affected public views of Clinton. 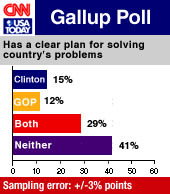 Doubts About Clinton's Ability to Run Country? Is Clinton Covering Up Fund-Raising Information? Is Clinton Honest and Trustworthy? Is Clinton Honest and Trustworthy Enough To Be President?